I think I have some sort of baking addiction. Does that even have a name? I obviously couldn’t ‘bake’ anything whilst we were away camping because it’s all ‘boil in the bag’ rice and chilli, or sausages and ‘Smash’. I didn’t even realise what I was doing as on my return I started grabbing ingredients in a daze. Instead of washing dirty walking socks I began printing off a recipe that had rattled around my brain all Weekend. As I should have been laying out the tent to dry I started to rub 1/2 a pound of butter into 3 cups of flour. 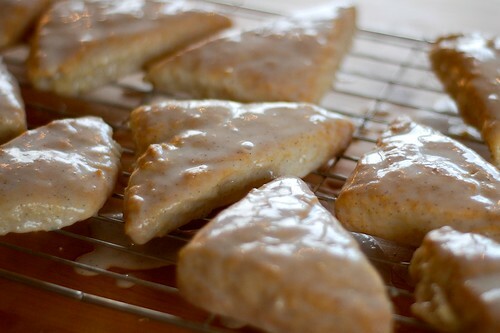 Then instead of sorting out dinner for the hungry travellers I was dipping tiny triangular scones into vanilla bean glaze and covering the worktop with icing in the process. I only paused to get some chocolate bread swirls out of the freezer ready to bake for breakfast. We are still working our way through these, mainly because I made about 30 of them. American recipes always seem to be so generous in their quantities. 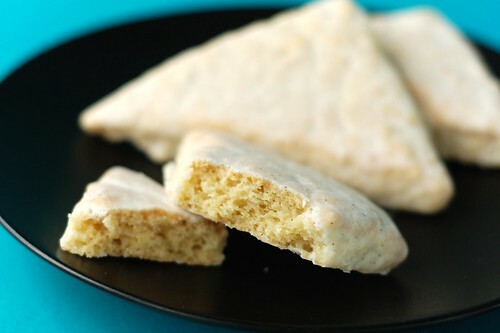 The Pioneer Woman website has recipes that tempt me with phrases like ‘these are less of a commitment than a regular scone’. They convince me to make enough to feed a family of hungry cowboys. 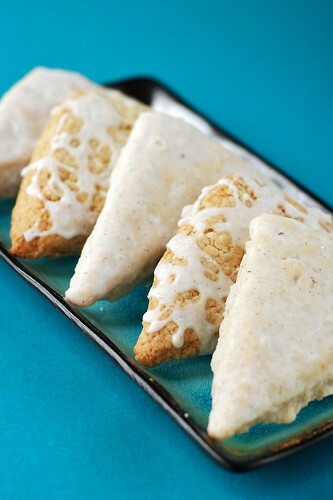 If you have a lot of people who need many small scones then Ree’s beautifully photographed recipe is here. I have even had to go and drop a batch of these off with a friend to save me from eating them all. You see they are made with double cream in the mixture and whole fresh vanilla pods so they are very rich. They stay moist and delicious for days and I have just had 2 with a cup of tea. But I am sure they are not health food. I think the reason I bake is that in the brief moments of calm between jobs-that-need-doing I feel that if I bake I have achieved something, and in the process I have provided food for the family. Even if they didn’t really want it. maybe we should start a help group, hello my name is lizzie and I am a bake-aholic, or is that the WI? Thanks Lizzie, but the WI is not for me, far too many rules! Sarah, it’s weird coming across the same blog template isn’t it? Good to see you found the work around for the header bar too. I have subscribed to your lovely blog. It’s odd, as I know I saw the name of your blog only yesterday but I can’t think for the life of me where it was. Did you comment on something on PW? haha, yes it is a bit weird. i am a frequent blog commenter so it could have been many places. looking forward to seeing what other things you make! These look gorgeous, that middle photo with the glaze is taunting me.